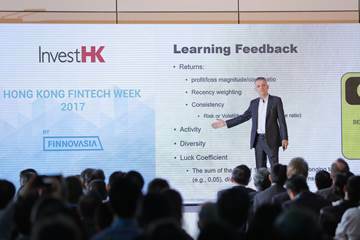 The umbrella technology artificial intelligence (AI) was the overarching theme on Thursday, Day 4 of Hong Kong Fintech Week organised by Invest Hong Kong (InvestHK), which combined keynotes from Ant Financial, Dianrong, Sentient Technologies and PwC with panel discussions and even an AI masterclass. It was standing room only for latecomers. 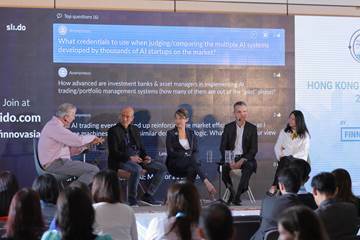 The venue at the Hong Kong Convention and Exhibition Centre was packed as the speakers and panellists dug down into some of the detail behind machine learning, robo-advisory and other applications of AI. 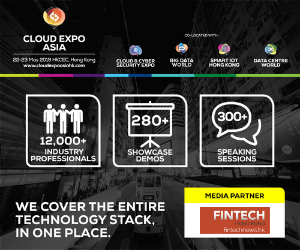 Days 4 and 5 of Hong Kong Fintech Week are being curated and arranged by Finnovasia. because there are now more than 100 countries involved. 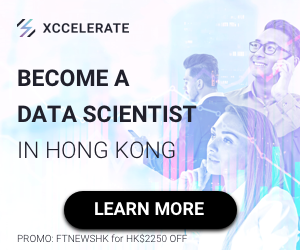 He added that Hong Kong can play a central role with financial and technical support and encouraged Fintech companies to make Hong Kong the launchpad for their business. A high-powered morning session kicked off with a series of keynote speeches. Soul Htite, Founder and CEO of Dianrong, the Shanghai-based peer-to-peer lender for individuals and businesses, talked about the “data tsunami” that is not the exclusive domain of the likes of Alibaba, Amazon, Tencent and similar companies, but is an essential asset for all organisations. Mr. Htite said data enables collective thinking and problem solving. He added that typically the more data they have on an individual or entity, the lower the rate of interest. Behind the data analysis lies the AI. 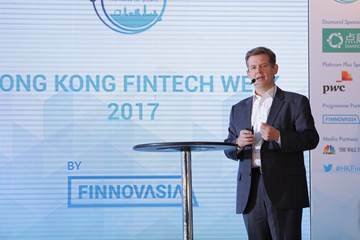 In his keynote, Douglas Feagin, President of International Business at Ant Financial Services, echoed Mr. Htite as he emphasised the importance of data and AI in handling a massive registered active user base of more than 520 million. AI is the key that enables these challenges to be addressed in a much more sequenced way, he said. 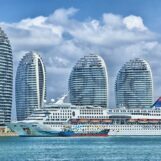 To help, Alibaba has invested heavily in AI research and development. 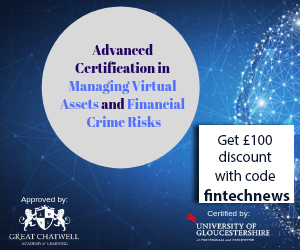 The key areas of investment are deduction and machine learning, prediction capabilities, natural language processing, and image and speech recognition. Using data to credit an individual credit score, it can improve the overall shopping experience, just as it can help with risk management. By looking at the transaction environment, it can flag suspicious activity and catch account misuse. said Mr. Feagin. So confident is Ant Financial in its technology that for just CNY 2 per year it offers fraud protection to users up to a value of CNY 1 million. As an example of AI in action, Mr. Feagin referenced last year’s 11:11 Singles Day, when US$17 billion of goods were sold. The payment infrastructure handled 120,000 transactions a second at its peak. He said that 97% of those transactions were serviced by AI, and customer satisfaction improved by 3% from the year before. The technology is scalable allowing for rollout in other parts of the world. In Hong Kong, Alipay Hong Kong, a joint venture with Cheung Kong, now has 4,000 retail merchants, while Alipay itself is available with 8,000 Hong Kong retailers, he said. Antoine Blondeau, Chairman and Co-Founder of Sentient Technologies, talked about AI in a more theoretic context. Sentient is now using AI to create AI, said Blondeau. He said a need for AI to be able to define success across a gamut of different and ever-changing scenarios. It needs to be capable of introspection; consciousness about the level of market exposure, the underlying market environment, levels of fear, greed or other characteristics. In his entertaining – and technical – speech, Eberhard Schoneburg. CEO and Founder, Artificial Life and also with PwC, offered a few words of caution. He noted that “any deep learning network can be manipulated,” which could cause machine learning to head in the wrong direction. He noted also the lack of people with reaI experience and that there will be AI-related crash in the coming years. During the afternoon, a panel session entitled “Beyond Roboadvisors: How AI Could Rewire Wealth Management as We Know It,” drew a packed audience. Mikaal Abdulla, Co-Founder and CEO of 8 Securities, said young people’s experience of banking is coloured by the 2008 global financial crisis. Using AI and robo-advisory, 8 Securities offers self-directed investing models with zero commission, and passive investing models. Mr. Abdulla said he expected the wealth management sector to go the way of retail following the arrival of Amazon, or the cinema since the emergence of Netflix and similar services – it will change fundamentally if not largely disappear. Nathan Stevenson, CEO and Founder of ForwardLane, said that robo-advisory accounts for only 10% of wealth management at the moment leaving huge room for growth. Fuelling that growth, he said, is that AI is using ever decreasing amounts of power, which is important for mobile phones. Ting Li, CEO of Yunfeng Financial, said she thought robo-advisory was still a long way from disrupting the market, because there isn’t enough trust. she said, adding that traditional banks could enhance their services in the future so they remain competitive. In another panel session on “Demystifying AI,” Connie Leung, Senior Financial Services Industry Director at Microsoft said that before talking about AI, banks need to know where they are at. They need to know how to embrace technology in the right way, but also inject their legacy because that’s what they have. She added that Fintech is advantageous because it brings agility to the front. Another panellist, Professor Pascale Fung at the Hong Kong University of Science and Technology (HKUST) stressed the importance of having new guiding principles or policies to facilitate the development of AI as we cannot use yesterday’s regulations for tomorrow. She highlighted the need to ensure safety, security, data privacy and transparency. Regulations should also be industry dependent as financial regulations are different from medical and pharmaceutical regulations. Any data regulation should ensure transparency and give the consumer the ‘right to know’. Adrian Lawrence, Partner at Baker McKenzie said a key issue is the increased fragmentation in AI regulation with different countries coming up with their own perspectives which don’t necessarily get us into a position of clarity. He said the answer might lie in thinking about the ethics of AI and building this into the ecosystem the protection that needs to exist. Benedicte Nolens, Senior Director at the Securities & Futures Commission cautioned that the applications of AI are so wide these days that it is not always possible to know what to regulate. That said, she added that whenever the application of AI leads to ‘exclusion’, there is a need for disclosure. Her view was echoed by Leiming Chen, General Counsel at Ant Financial who said from a Alibaba perspective, which puts user experience first and from a legal perspective, a fundamental part of the user experience is the ‘right to know’ so people can make informed decisions. 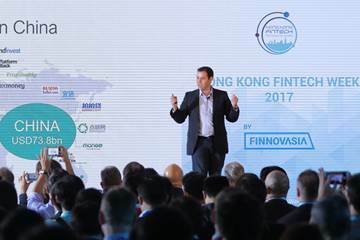 One thing AI and robo-advisors won’t displace is the Fintech Association of Hong Kong, a valuable focal point for the Fintech sector in Hong Kong that launched earlier this year. 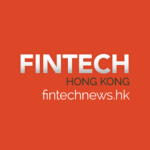 Some good news: today it announced that it has signed three separate Memorandums of Understanding with its counterparts in Singapore, Switzerland and Taiwan to promote global Fintech.